The icicles hanging from your eaves and gutters last year may be a faint memory now. But winter is coming, and along with it one of your home’s worst enemies—ice dams. 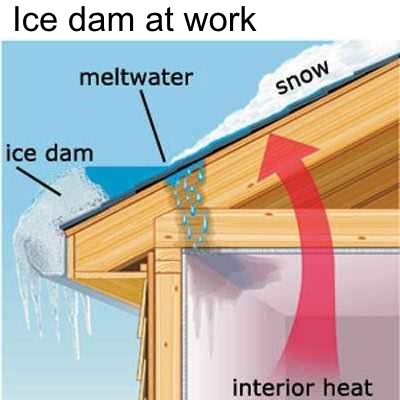 Ice dams are continuous chunks of ice that form along the margins of your roof. While frozen, they’re no more trouble than the icicles that hang down. But during the warmer parts of a winter day, water melting off the roof pools behind the ice (Fig. A), then seeps back up under the shingles. Sometimes water can work its way 5 or even 10 ft. back up under the shingles. Eventually it drips through the roof into the soffits, walls, and worst of all, onto your ceilings. You’ll first see ice dam rust spots on drywall fasteners, then perhaps peeling paint, sagging drywall and stains around windows and doors. Now is the best time to stop ice dams, before winter comes and before they build up. In this blog, we’ll tell you the best ways to prevent ice dams. And we’ll also outline the few options you have once you’ve got them. Ice dams (and icicles) form when snow melts, runs down your roof and refreezes near the edge.There it freezes, creating a rim of ice. This rim can grow, trap more water behind it, and then you have a full-fledged ice dam. Things that help in preventing ice dams is simply to keep your attic and roof cold. After a snowfall, a cold roof will have a thick blanket of snow. A warmer roof, however, will soon have clear spots where the snow has melted off, and may well have icicles hanging from the eaves. In the average home, about one-third of the heat loss is through the ceiling into the attic. And most of that loss comes from air leaks caused by unblocked walls, gaps in drywall, and cracks around light fixtures, plumbing pipes, chimneys, access hatches and other ceiling penetrations (Fig. A). Air leaks can be tough to stop. You have to climb into your attic, pull or rake back insulation, and plug the leaks using foam, caulk and other methods. Low roof angles make some air leaks difficult to reach. While you’re in the attic, check the depth of your attic insulation. Building codes require about 12 to 14 in. of fiberglass or cellulos. Add more if you have less than 8 in. and have had ice dam problems in the past. Blown-in cellulose and fiberglass are usually better than hand-placed batts, because they fill more tightly around rafters, joists and other obstructions, leaving fewer gaps. Attic ventilation draws in cold outdoor air and flushes out warmer attic air, cooling the attic and the roof in the process. The minimum ventilation area (size of the openings) should be about 1 sq. ft. of vent per 300 sq. ft. of ceiling area (attic floor area), when half the vent area is low on the roof and half is high. Run special adhesive ice-and-water barrier from 3 to 6 ft. up the roof from the edge the next time you reroo Ice and water barrier is a type of self-sealing underlayment that adheres to the roof decking and waterproofs it. You shingle over the top of it. It’s required by the building code. Rake the snow off your roof after a heavy snowfall. A roof rake, which is an aluminum scraper mounted at a right angle on a telescoping aluminum pole, is the simplest solution for occasional heavy snows. If you pull the snow down, it can’t melt and form an ice dam. We specialize in Ice dam removal in the winter time. We get on the roof and clear the snow 4 feet from the gutter sometimes more depending on the home and issue. And use bags of calcium chloride to help melt the ice dam so the water can channel out. Usually when we get calls your already leaking and damage has occured so there is not much else that can be done besides you taking all the necessary precautions to help not getting ice dams in the first place. Like making sure you have Ice&Water shield I prefer Grace brand. Make sure your attic has enough insulation and proper ventilation. And we live in Michigan Ice dams are gonna happen if you know you have a certain area on your home that gets ice damming then keep that area clean with a roof rake after every snow just like you do your side walks.